Le Soleil campsite is a lovely 5 star campsite that’s located at the point where the beautiful Pyrenees mountains plunge into the Mediterranean sea. 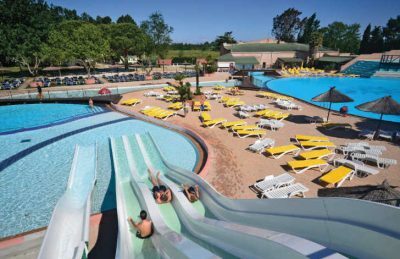 This brilliant family friendly campsite stands within 10 hectares of beautifully landscaped grounds and offers everything you could possibly want from a family camping holiday in the south of France. The campsite is both large and lively with a brilliant range of activities and facilities both on-site and also nearby to ensure you have a fabulous time. The campsite has also been awarded the “Label handicapped Tourisme” status which means that it has been recognised by French officials as suitable for handicapped guests. Le Soleil is popular with younger families outside of high season, but during high season there’s a great range of evening entertainment including a nightclub for the under 15’s making sure your children can fully enjoy their summer holiday. One of the best things about La Soleil is its location. Direct access to a wonderful uncrowded stretch of sandy beach means that you’ll always have enough space to call your own. As well as being perfect for families to enjoy the sun, the local beach is perfect for those wishing to enjoy some of the local water sports such as windsurfing and canoeing and for those really looking for something different will love Le Soleil’s diving centre where those wishing to can take diving lessons. In our opinion the jewel in the crown at Le Soleil campsite is its wonderful swimming pool complex. The Californian styled swimming pool is surrounded by green plants and sun terraces where you can sit back and relax. There are 2 pools in total with a selection of slides and although not the biggest complex in the region it is sufficient to keep most families happy on their holiday. Le Soleil campsite offers a comprehensive selection of activities and facilities on site and also nearby to ensure you have a fantastic family holiday. On-site activities at Le Soleil campsite include table tennis, football, boules, scuba diving, badminton, volleyball, basketball, trampolines, bouncy castle, playground and cycle hire. Facilities available at Le Soleil campsite include WIFI, restaurant, takeaway, bar, groceries, games room, animation team, washers and dryers. Accommodation at Le Soleil campsite includes a range of 2 and 3 bedroom mobile homes and tents that are available from Eurocamp.